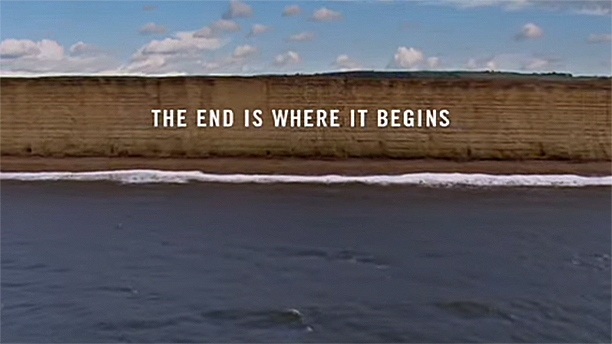 The first two teasers aren’t much help at all in that regard – they’re both just long, foreboding tracking shots of various Broadchurch-ian settings, all built around the mysterious message “The End is Where It Begins”. The third and fourth clips are a bit more interesting, as they both feature voiceovers from the series’ stars, combined with long, foreboding tracking shots of the cliffs. As an extra bonus, time you can just make out Alec Hardy and Ellie Miller standing on top of one of them. Tennant’s brief narration poses the question of why Alec is still in Broadchurch if he caught Danny Latimer’s killer. Meanwhile, the Colman-narrated clip features a voiceover about how the Latimer murder basically destroyed Ellie’s job, family and town. As viewers, we’re clearly meant to ask ourselves what’s next for these characters (heck, even what’s next for this show) after the events of Series 1. But, that’s really as much as we can extrapolate about the plot of Broadchurch Series 2, and frankly, that’s really not a lot to go on. So feel free to start your speculation engines now – will this season focus on another murder? On fallout from last year’s murder? Why is Alec still in Broadchurch? The bulk of the main cast is all set to return alongside Tennant and Colman, including Arthur Darvill, Jodie Whittaker and Andrew Buchan. They’ll be joined by a few new faces, such as Eve Myles, Charlotte Rampling, James D’Arcy and more. Is anyone else really excited for the return of Broadchurch? Get a look at the trailer for the all new "Vanity Fair" coming this year.